Glass Agencies EROSE are manufacturer of Glass Slab. We manufacture & export Glass Slabs. These Glass Slab are having parallel polished Surfaces from all sides. These are used for pin method experiments, and manufactured from Indian moulded Glass. Nbms Global Trade Pvt. Ltd.
Glass agencies are manufacturer of glass slab english under erose brand. Lenses / Glass Slabs / Prisms we offer are manufactured using bubble less English glass sheet. The English Glass Slabs have parallel polished surfaces from all the sides. Glass Slab MSW-008PH: Rectangular, all sides polished, made from slightly greenish glass free from bubbles. 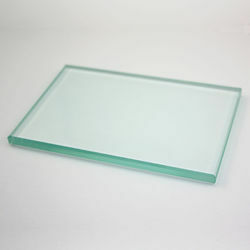 Being a customer oriented organization, we are deeply engaged in offering a wide array of Acrylic Glass slab.